Choosing the right first single is a very exact science, and there are many factors to consider. Are you coming back from a hugely successful debut? Then you’ll be wanting a record that announces you’re BACK, but even better than before – something bombastic like It’s a Sin then. Have you just had a massive Greatest Hits and are worrying no-one will care that you’ve made a new record? Return with something along the lines of Rotterdam. Have you veered perilously close to the dumper recently and need a hit to boost your flagging career? Spinning Around will do very nicely thank you. Had a nasty bus crash? New Beginning (Mamba Seyra), or for that matter, Coming Out of the Dark (although to be truthful that one didn’t work particularly well for Gloria Estefan). 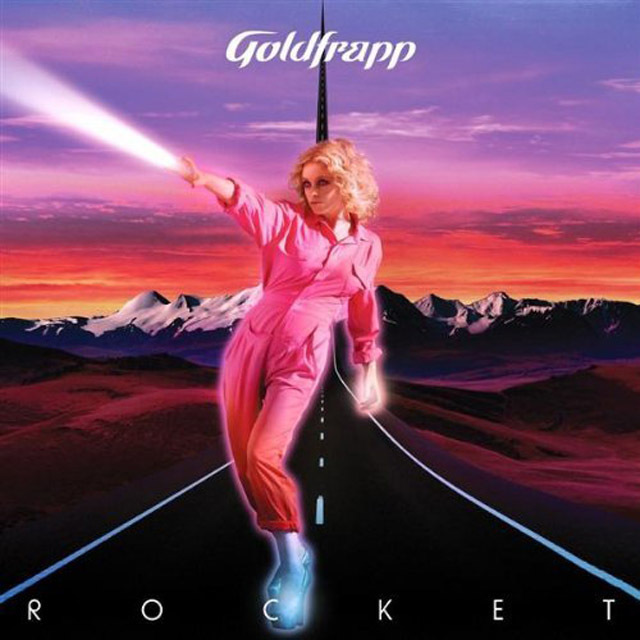 Goldfrapp – once they got into the habit of having hits – had always possessed a knack for picking great first singles – Train, Ooh La La, A&E – and so by the time fifth album Head First came around in 2010 I certainly made the assumption that Rocket was going to be a huge smash. After the pastoral delights of Seventh Tree we were fully expecting a bit of a stomper, and Rocket was exactly that – a synthy blast of bitter pop that somehow manages the impressive feat of simultaneously channeling Van Halen at the height of their eighties pomp (by which I mean Jump) and the Pointer Sisters at the height of theirs (by which I mean, er…Jump). And yet still it remains very, very Goldfrapp. Not that I’m awarding points, but if I were, Rocket would get extra for finishing on a countdown from five and an almighty explosion. Another thing I particularly like about it is its “conceptual” artwork, which recalls the kind of records made by expensively launched, supposedly sophisticated but often tuneless pop groups in the eighties – records which invariably flopped and could shortly thereafter be found lurking in Oxfam between Mandy Smith twelve inches and anything by Spandau Ballet after Gold. Alison is pictured on a futuristic highway in a very costly looking pink jumpsuit shooting a laser beam from her right hand. I wouldn’t be at all surprised if Ms Goldfrapp actually can fire lasers at will, and for all we know this is simply a lovely moment caught on film. Nevertheless, the record buying public didn’t take to this one – desite my bold claims that this had “number five written all over it,” Rocket limped into the hit parade at no.47 and shot back out again in a manner not unlike the rocket of the title. Goldfrapp retain a sizeable and loyal fanbase to this day, but their days of chart supremacy are over – another act swept away by the download revolution and shortened attention spans. Also I suspect the marketing person at Mute left for a job at one of the majors and they forgot to replace them – it is a while since they’ve had a hit. Who could sing this today and have a hit? I so dearly wish that Leona Lewis would do something this ballsy. I know she’s got it in her.